Integrating trees into horticultural systems offers opportunities to diversify the business as well as realise environmental benefits. 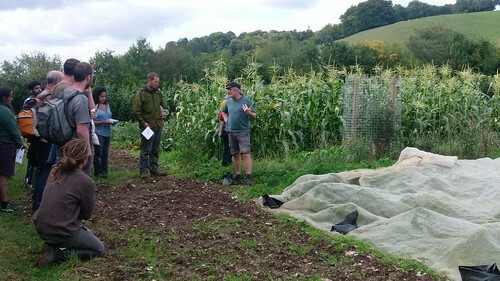 This workshop at Tolhurst Organic focused on providing practical advice and pointers on how to successfully implement an agroforestry system on your farm as well as an opportunity to learn directly from Ian Tolhurst’s (Tolly) experiences. The day centred around Tolly’s recently planted agroforestry system which has been integrated into his organic vegetable production system. Established in 2015, six single tree rows, a mixture of trees for fruit, timber and coppice products, have been planted with 20m wide cropping alleys in between. You can read more about Tolly’s agroforestry system and ORC’s research on the system here. The day started with introductions and an overview of the day, then we all headed out for a guided tour. The tour concentrated on the pros and cons of planting trees for agroforestry in horticultural businesses. Tolly talked us through his field scale veg rotation and how agroforestry and trees in general fit into his system. We started by hearing about Tolly’s homemade woodchip compost and then were shown a new trial where Tolly has applied green uncomposted (ramial) woodchip, sourced from his boundary hedge, onto his green manure. Working with the Organic Research Centre he is monitoring performance of the ramial chip alongside his normal fertility building treatment of composted woodchip applied to the green manure. We then crossed over the road into the agroforestry field with discussions on species choice and design; tree establishment; understorey management; the economics of planting and managing trees. Different approaches to understorey management have been trialled including daffodils, rhubarb, cut flowers and globe artichokes. The intention was to make more efficient use of all available land and reduce the impact to the business felt through loss of cropping area. However, the understorey crops have been a mixed bag; the daffodils and cut flowers have been reasonably successful with production increasing year on year, but both the rhubarb and the artichokes have succumbed to verticillium wilt and need replanting. The value of the understorey to biodiversity was discussed and some of the initial findings from the research presented, the plant species richness of all the tree rows has increased year on year, providing an important resource for pollinators and pest predators. Tolly talked through the practicalities of establishment and lessons he had learnt, for example he had not considered the impact that tree rows would have on his ability to move crop covers around the field. Luke from the Woodland Trust gave an overview of the grants and support that are currently available to cover the costs of tree planting, including the Woodland Trust’s partnership scheme with Accor hotels which is designed specifically for agroforestry plantings and helped to fund Tolly’s new tree planting. He also talked about the importance of tree protection in the first few years. After lunch Niels Corfield led the group through a thought-provoking design workshop where we were asked to consider some hypothetical scenarios for windbreak creation on a market garden, considering both crop protection, aesthetics and practicalities. We will be focusing future workshops and the activity of the trees and horticulture group around these areas. If you are interested in being part of the group please get touch with Sally Westaway or you can sign up to become part of the wider network.